My first official post on my trip to Tanzania. It’s only 14 days and counting and I have been thinking about this trip since late November 2008. On June 7 I will be traveling to Tanzania on a trip that is likely to change my perspective on life itself, so I expect this trip to be life changing. It was a dream to have created an online competition that brought me to meet the Alexander’s, Christina and Godwin. 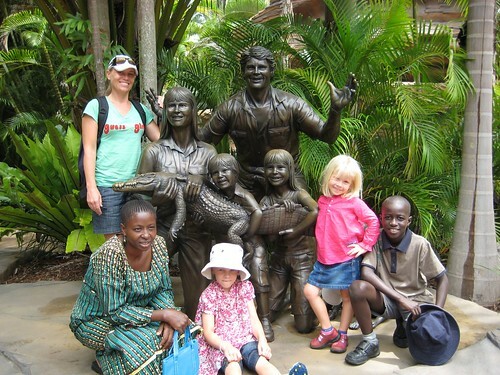 On November 15, 2008, Australia Zoo played host not only to thousands of people for the 2nd annual Steve Irwin Day, but some very special guests invited from Tanzania. I played somewhat of a humble host and fell in love with the nature of the Alexander’s and the beautiful souls that are Christina and Godwin. I will be embarking on a 3 week journey of Tanzania, visiting the Alexander’s, Christina and Godwin, here is a simple breakdown of my itinerary. Plenty more posts to come as my trip nears. I hope you will join me by following my blog updates right here throughout my journey.